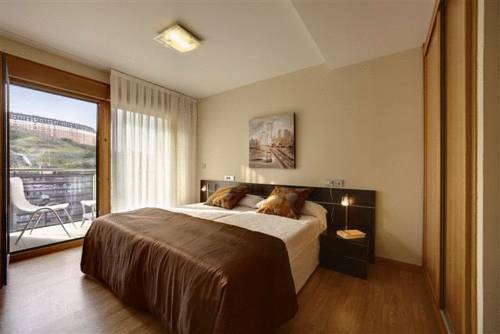 Bilbao Apartamentos Atxuri Bilbao, Hotel Spain. Limited Time Offer! Apartamentos Turisticos Atxuri. "Apartamentos Turisticos Atxuri" has obtained 3 stars. The hotel is a convenient base point for visiting Bilbao. Thanks to the tranquil atmosphere of this accommodation, it is a perfect setting for those who want to escape their daily stress. The interior of "Apartamentos Turisticos Atxuri" boasts its simple and elegant decor. This accommodation has a capacity of 26 rooms. The hotel features a gymnasium where you can exercise. "Apartamentos Turisticos Atxuri" offers massage treatments. There are child care facilities available where your children will be happy to play with other kids. You have access to the Internet at no extra charge. The Atxuri Apartments have an ideal location in central Bilbao, a short walk from the historic old town. This modern complex offers a gym, rooftop terrace and free Wi-Fi. Each Atxuri apartment has simple, elegant design.